There are loads of Christmas/Winter-themed games out on the App Store right now, including updates to some of your favorite games. IUGO Mobile Entertainment updated three of their titles (Implode, Zombie Attack 2 and Cliffed) to add holiday content, Chillingo updated Minigore and there are loads more. While this add-on content is a lot of fun, in this post, we want to focus on games who’s main focus is to offer some holiday fun. The games range across all genres, so you are bound to find something that you’ll like. There are loads of these types of titles on the app store, so obviously there is no way that we’ve played them all. If you have any additional suggestions of titles you feel deserve a mention, feel free to put them in the comments section. 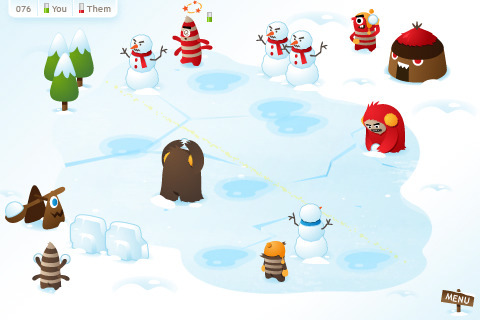 It’s an all-out 3 on 3 snowball battle in this great game by We’re Not Rocket Scientists (WNRS). First you choose which three players you want on your crew, Jailbird (who is well-balanced), Dr. Smooth (who can throw fast, but lacks power), or perhaps Tank (who packs’ a punch, but is a bit slow and lacks accuracy). Choose any combination you want, pick your hood and then it’s game-awn. Hide behind snowmen, reposition your troops and flick away, trying to take out the other team before they take out you. The Yo Gabba Gabba graphics and animations are absolutely adorable. SnowRumble is our top pick and well worth the $0.99 price tag. Blast those greedy, thieving elves into oblivion in this Inkvaders-like gore-filled side-scroller. You play as either Santa or Rudolph and basically just keep going back and forth as elves try to steal presents from your sleigh. 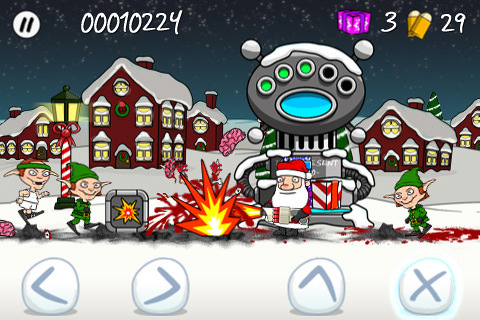 Survive as long as you can, protecting the presents by shooting the elves dead with a variety of weapons including flamethrowers, muskets and machine guns. This one’s mature content means its not for the kiddies. The reindeer have gone on strike and now it’s up to Santa to deliver the presents himself. 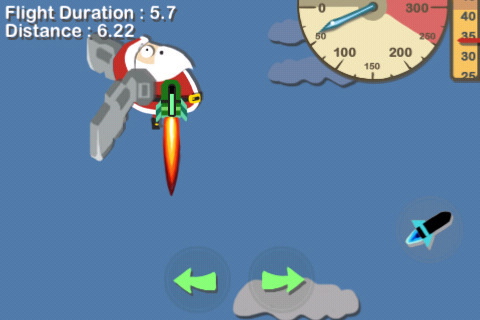 Launch Santa into the air and see how long you can keep him in the air, by adjusting his angle and purchasing all manner of upgrades including rockets and wings,and by increasing attributes like launcher power, energy and air resistance. A Christmas Santa offers a fantastic RPG-like system and has some wonderful South Park style graphics. A Christmas Santa is actually more fun than many of the non-holiday themed “furthest distance” games we’ve played on the platform. A free light version is also available. Elf Command is a cute little time management game where you are a robot elf in Santa’s Workshop and you must help sort the gifts into their orders. Simply, drag gifts from the conveyor belts to a matching order station. The game starts off easy with just one item per order, but gets progressively more difficult with as many as 3 items per order. And with for order stations to maintain it can get pretty harried. Deliver all the gifts before the time runs out. Elf Command is a great choice for fans of Time Management games, with its FREE price tag, even people who aren’t usually fans of the genre should check it out. Ever wanted to know what it feels like to be a giant snowball…well now you can! 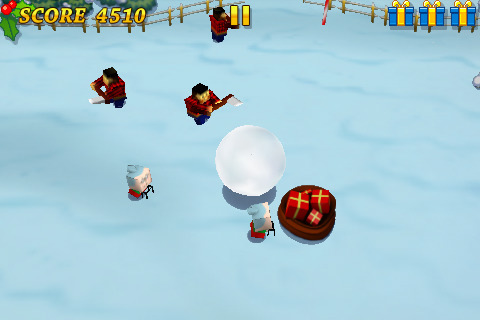 Snowball smash puts you in control of a giant snowball and it’s your task to protect Santa’s gifts from looters. Tilt the device to move the snowball and roll over old ladies, Eskimos, penguins and woodsmen, keeping them from escaping with any presents. Snowball Smash is a lot of fun, and inappropriately satisfying. The fluidity of the movement and controls is spot on and offers a nice Holiday distraction. Flight Before Christmas is for all intents and purposes a Christmas-themed Flight Control. 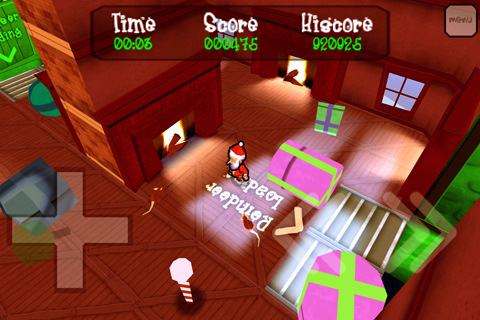 Guide Santa’s sleight from house to house (by drawing paths) delivering presents and avoiding other flying objects. 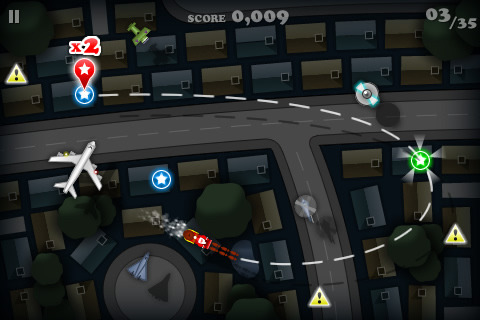 Fans of Flight Control and other path-drawing traffic-management games will like this one. You must help Santa push as many gift boxes out the door before his reindeer take off without him! We included this one because of it’s unique visual style and OpenFeint inducing addictive quality. We had fun playing it and since it was free, we were willing overlook some slight roughness and the occasionally frustrating controls. 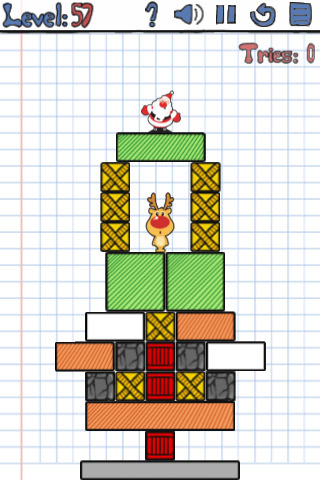 Elf is a game in a similar vein as Doodle Jump. You must guide Elf safely skyward as grabs snowflakes with his tongue for boosts and avoids dangerous thistles. 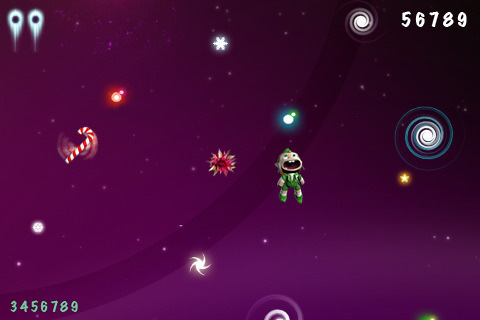 Unlike Doodle Jump, if you start falling, it is possible to save yourself and regain some lost height without immediately losing. It’s got some nice, cute graphics and can get pretty addicting. Attempt to drop the Santa doll safely onto the platform by removing the unnecessary boxes. Certian boxes may have different effects, like floating or explosions, so you may need to get creative as you decide how best to proceed. The game has almost a Jenga-like feel to it and will get you thinking. Okay so maybe this one doen’t really meet our initial Criteria since there is a non- Christmas version of DropBrick too, but since we didn’t already own the regular release and this was free and entertaining, we included it. Oops here we go again…throwing out the rules again with a Christmas version of Westbang! If you are unfamiliar with Westbang, it’s an old-west style quick draw game where you must shoot outlaws as the saloon doors open, being careful not to accidentally shoot someone peaceful. In this Christmas version, Santa and his brothers-in-arms are attacking your city and trying to rob your bank! 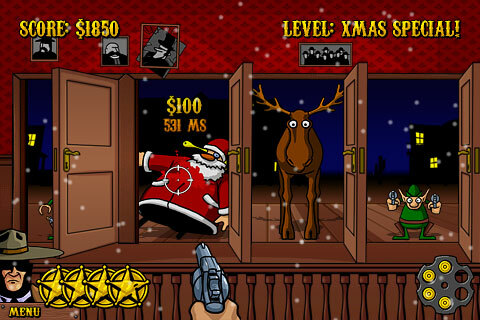 You are up against the Bad Santa (and his Machine Gun! ), Ugly Elves, Evil Reindeer and more. It’s a fun, free, holiday-themed version of Westbang that fans of the tile will enjoy! Snowball tossing squirrell. Great graphics. Snowball fight. Fun and nice graphics, but ultimately SnowRumble was our top choice in this genre. Tilt left and right to move Santa’s bag to catch presents. Great graphics, unfortunate name. Like the game Paper Toss, but with presents.